What is a good moveset for Jolteon? If you have a good competitive moveset for Jolteon, post an answer below and upvote the best ones. Movesets for any of its pre-evolutions can also be shared on this thread. Jolteon Pokédex and learnset for reference. 'Hey i cant get Signal beam for some reason what do i replace it with? Not Sure if it's good,but in game he seems good. Thunderbolt: STAB, good power, chance to paralyze, high accuracy, can attack Pokemon using Fly. Shadow Ball: Decent chance to lower Sp. Def, good power, high accuracy. Type coverage is its main use. Signal Beam: Since Grass types are pretty much immune to electric, you want this. Thunder Wave: A beter option than agility since it not only slows the foe down, it can stop them from attacking. This is good because very few Pokemon can outspeed Jolteon. Other good moves for Jolteon to use are Substitute and Baton Pass. How about hidden power ice instead of signal beam? It covers ground too. This is a good move set, quick question though for the Thunder Wave which paralyzes and lowers speed, doesn't Thunderbolt have a chance of paralysis already? And since he is already fast do I really need to lower speed? I was thinking that "Magnet Rise" would be a good move for him which protects him from his weakness for 5 whole turns. Please let me know your thoughts. I already have, Espeon (Fast Special), Leafeon (Physical), Glaceon (Special Bulky), Vaporeon (Offensive Bulky Special), Sylveon- which is my hardest special hitter ATM and also pretty damn bulky and now i just got Jolty and I still have to start EV training him. Let me know. Thanks!!! hey what evs are good for this set ? Use Wish. Then next turn use Volt Switch. The Pokemon sent out gets healed, which should cover any damage you took when you switched. So really, this is a safe version of switching (plus Volt Switch does damage.) Thunderbolt is for when you want to stay in. Shadow Ball provides type coverage. Magnet is used to increase the power of both Volt Switch and Thunderbolt. Seeing as you have two electric type attacks, this is fine to have as an item. You don't need much for speed EVs, just enough to outrun everything without boosts. A decent amount of Special Attack is given, mainly to put some power behind your Volt Switch. The HP EVs are there so Wish will heal the next Pokemon more. Thunderbolt: Nice choice for STAB. Volt Switch: Scouting, gets STAB. Shadow Ball: Nice move, eeveelutions don't have a ton of options. Hidden Power Ice: Takes care of ground types who are immune to Jolteon's STAB, also good against dragons and grass types wich recists Jolteon's STAB as well. Well, here's something different! With such a massive base Sp Atk and Speed stat, it's to be taken advantage of! The idea is to use a Choice Specs to lock on Charge Beam or Echoed Voice (both will get more powerful with each successive hit) until something blows up! If you run into trouble, simply switch, which allows you a chance to lock on Roar or Thunder Wave. Locking on Roar will allow you to annoy your opponent like crazy! Especially if you have Stealth Rock, or Spikes up, this will come in handy! Locking on Thunder Wave may seem silly, but if your opponent doesn't know you're Choice, they might switch when their Pokemon becomes paralyzed, which will get them paralyzed! I actually haven't tried this set out myself (in process of transferring from Emerald to Black right now), but it seems fun and I hope you all enjoy it too! Its quite a strategic moveset but try not to post movesets with experiencing them first. Flame Orb + Quick Feet means he doesn't need Ev's in his speed to sweep. Maxed Special Attack makes Thunderbolt amazing, while I have 252 Hp Ev's to make Wish a better move to use. ( Bigger Hp boost ) Substitute is to baton pass away, and set up Flame orb, and wish. While having Thunderbolt as your sweeping option. Why not charge beam instead of Thunderbolt? Also as of Gen 5 It heals half the health of the person receiving the wish heal so if Jolteons HP is 200 and it wish passes to a Pokemon with 100 Hp you will only pass 50 Health. In PO when I use my Chansey ( 700 something Hp ) I use Wish, give it away the pokemon I give it to recieves 350 Hp, no matter what. And Thunderbolt is to straight up sweep, immediatly, not to set up and give away. That slot is mainly for if I plan on sweeping. Optional(Some people like to add in dig, and others iron tail. Light Screen is another option for raising special defense and some people like to add in toxic here but this last slot can be whatever you want. Maybe a varity of attacks like dig instead of last resort. Light Screen provides team support. Shadow Ball and HP Ice are coverage. Discharge hits multiple foes with STAB damage and a good chance of paralysis. This is a good moveset, I run a very similar moveset on my Jolteon. thunder because even though it has low accuracy, you can always get a chance to hit. plus jolteon has a lot of sp.attack. now yall are thinking:what? quick attack? strength?! well, quick attack is for Pokemon that have moves like aqua jet, extreme speed, quick attack and ya. jolteon is the fastest eevee evoloution.so using quick attack could work out. why strength? um ground?jolteon an electric type weakness is ground. with strength, before you switch out to another Pokemon, you might want to do some damage to that ground type.discharge is for other electric types. exept for electric types with like motor something whatever its called or maybe lighting rod. maybe even another jolteon who has volt absorb. but if that electric type doesnt have a move to have electric do no effect, use discharge. Perfect wall.Subs so you can use wish while fighting ground types if your ice or water type at low health.Thunder wave for slow Pokemon on your team.Volt switch no explaining.Wish no explaining. There were gem items for each different type in Gen 5, but only Normal Gem has returned since. Jolteon is one of my favorite Eeveelutions and electric types! 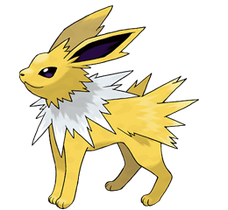 Jolteon is one of the fastest Pokemon, is one of the classics and is another one of those Pokemon so it should have deserve a great fast speical moveset. To bad that Jolteon can't learn elctro ball with all this speed or else I would of made another set. Strategy: Start with substitute, and use it until your opponent misses or doesn't attack you. With a substitute to cover your low defenses, use Thunderwave to paralyze the enemy to lower their chances of being able to hit you. Then use Double Team multiple times, until you're confident that you will not be able to be touched. You're then clear to use thunderbolt. Even though this moveset only has one damaging move, Jolteon with high SpA EVs is easily strong enough to take down most Pokemon that can resist thunderbolt. If the substitute fades, simply just use it again (unless you're low on hp, just rely on your double team and your opponents' reduced accuracy. - replace Thunderwave with Shadow Ball for more type coverage, incase you come up against any ground or steel types. Is Covet a good move for Jolteon? What is better for jolteon agility or double team? Jolteon or Glaceon for White 2? Best item for my Jolteon (competitive)?